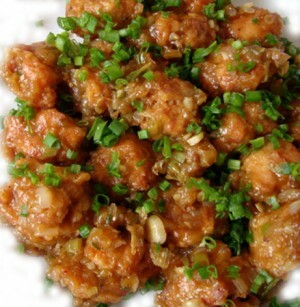 Chicken Manchurian recipe by Mahirah Ali at DesiRecipes.com. Marinade Chicken in the marinade ingredients for atleast 1 hour. Heat oil in a Pot, and carefully drop the marinated chicken into the hot oil. Cook on low medium flame and towards the end of the cooking process increase flame to high and deep fry to a golden brown shade. Keep aside. Once again heat oil(sesame if avaible) in a seperate pan, add the chopped garlic and saute for few seconds. Now add chopped ginger and green chillis and saute again. Add the onion and saute for 3 minutes on high flame. Reduce to medium heat and add the brown sugar , soya sauce, tomato paste, chilli sauce and vinegar . Combine well and cook for 2 minutes. Add 1/4 cup chicken stock or water and cook for a minute. Add the deep fried chicken at this point and cook for 4 minutes. Add the 'cornflour water'(by mixing cornflour and water) and cook, tossing for 4-5 minutes. You will find that it becomes thick due to cornflour. Remove fom heat. Ganish with green onions and Serve hot with chinese rice. VERY EASY TO COOK & DELICIOUS.THANKS.